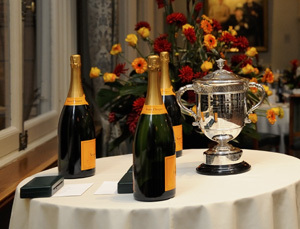 The Veuve Clicquot flowed as the 2013 Walter Lawrence Trophy winners, joined by guests including Jonathan Agnew, Allan Lamb, Mike Gatting and Lord MacLaurin, enjoyed a splendid evening in The Long Room at Lord’s on October 15, at the Presentation Dinner hosted by the ebullient John Barclay. The main Walter Lawrence Trophy, awarded for the fastest hundred of the season, was won by Kent’s Darren Stevens, who battered a blistering 44-ball century against Sussex in the Yorkshire Bank 40 match at Canterbury on June 19. Chasing a formidable Sussex total of 336 for 5, the 37-year-old all-rounder hit 10 fours and 6 sixes in his hundred, in 53 frenzied minutes, to propel Kent to victory by 3 wickets with 9 balls remaining. A consistent match-winner with bat and ball, Stevens finished with 118 off 53 balls, including 12 fours and 7 sixes, and chipped in with two key wickets. 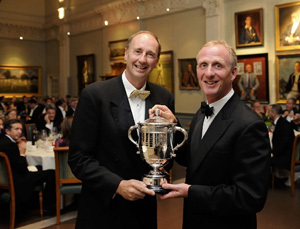 Sadly, Stevens was unable to be present, but Matthew Fleming, Kent’s last winner of the award in 2002, accepted the Trophy and a cheque for £3,000 on his behalf from guest speaker, Jonathan Agnew. Now in its 79th year, the Walter Lawrence Trophy is open to all domestic county competitions as well as One-Day Internationals, Twenty20 Internationals and Test Matches in England. 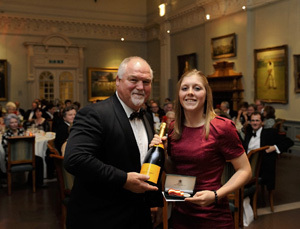 England’s Heather Knight was the worthy winner of the Walter Lawrence Women’s Award, which is won by the batsman who makes the highest individual score in a season. Having led the competition since May 6, when she made an unbeaten 153 in the LV Women’s County Championship, Heather eclipsed that score with a defiant innings of 157 for England Women in the Ashes Test match against Australia Women on August 13. Playing in only her second Test, opening bat Heather rescued her side from a precarious situation with a marathon knock, scored off 338 balls and including 20 fours, and shared a record England seventh-wicket partnership of 156 with Laura Marsh at Sir Paul Getty’s Ground, Wormsley. The 22-year-old brought up her century in 263 balls before being run out on 157, the seventh highest score by an Englishwoman in Tests, for which she won the Player of the Match award. Rochdale-born Heather has played in 39 One-Day Internationals and 11 T20 Internationals for England and, as captain of Berkshire Women, enjoyed a prolific season scoring 604 runs in the County Championship averaging 100.66, as well as 225 runs in the T20 County Championship at an average of 56.25. She is the second winner of the Walter Lawrence Women’s Award since it was introduced last year and received a silver medallion and a cheque for £500 from MCC President, Mike Gatting. 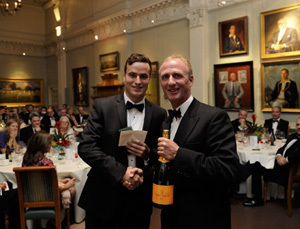 The Walter Lawrence MCC Universities Award, which is for the highest scorer in an innings played against one of the other five MCCUs or against one of the first-class counties was won by Ivo Hobson of Durham MCCU. The 22-year-old right-handed opener scored 129 against Cambridge MCCU, including 11 fours and 1 six, in the drawn 2-Day MCCU Championship match at Fenner’s on June 11. 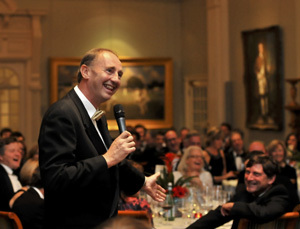 Hobson, who is a Human Geography graduate, is the second Durham University player to win the award and the eighth recipient since its inception. He received a special silver medallion and a cheque for £500 from Matthew Fleming. The winner of this year’s Walter Lawrence Schools Award for the highest score by a school batsman against MCC is Nitish Kumar of Repton School. Chasing an MCC total of 236 for 5 off 50 overs on May 7, Nitish made an unbeaten 154 off just 102 balls, including 22 fours and 1 six, to see his side home by 8 wickets. His school season run-total of 909 featured three hundreds, while he also took 34 wickets, including 8 for 11 against Free Foresters, the best bowling figures in UK schools cricket this year. Now 19, Nitish is a Canadian International cricketer, who became the youngest player to debut for his country in a first-class match when he played in an ICC Intercontinental Cup fixture against Kenya in 2009. He subsequently became the second youngest One-Day International player in 2010 at the age of 15 years and 273 days. Following this year’s school season he returned to Canada and scored his maiden first-class hundred against UAE in August. 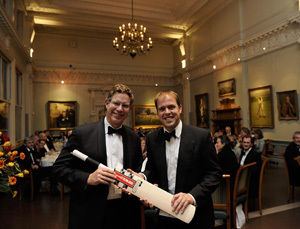 His prize of a special medallion and a Gray-Nicolls bat was collected by Repton’s Director of Sport, Ian Pollock.